It’s gift season 2014 and the Prime Minister and Editor have invited two knitters, a brand new one, Sandra, and a very experienced one, Dale, to make pattern choices in our place. In addition, we’re introducing patterns featuring knitCompanion formatting for the first time. See From the PM’s Desk for details about these and Julia Grunau’s story about meeting Sally Holt, knitCompanion’s founder. 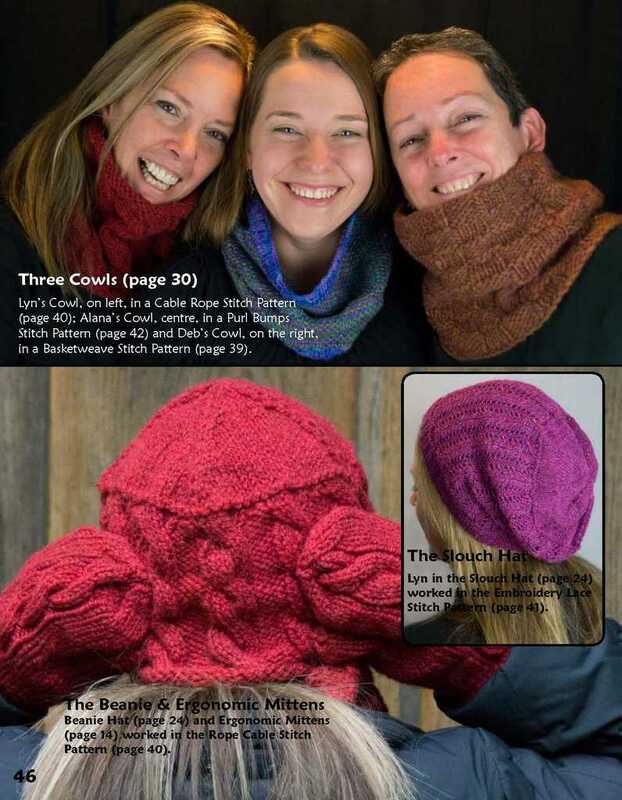 We’ve collected knitCompanion patterns in this newsletter, and you can see all the patterns available to date right here. kCDesigns are pre-formatted so you can just start knitting. A wonderful designer, Sally Melville, is back with some new and characteristically innovative designs. Almost two years ago, I was contacted by a person named Sally Holt, who wanted to explore the idea of an association between Patternfish and her knitCompanion project (whatever that was). I am always so involved with Patternfish that I can't keep up with all the great new innovations in our world. And the knitCompanion app, after some research, did turn out to be a great new innovation, and an exciting one. So Sally (who is based in Colorado) and I agreed to meet in person one morning at the Long Beach TNNA in February 2013, just outside the show doors, to discuss a joint venture. In her emails to set that up, she had demonstrated a puckish humour: she would be wearing "a knitted vest made from Noro (hard to miss!)" and described herself as "about 5ft 4in (you will not see me towering about the crowd ;)". We found one another easily and talked. Sally wanted to be able to sell kC-preformatted versions of designs so that users wouldn't have to do the input themselves; it can be time-consuming depending on how complex the project. She had approached other sites with the idea but had been turned down (it would, after all, be a lot of work). She talked about the existing kC fan base, which was huge. I also knew that some of our publishers are also teachers, and had remarked on how many of their students were avid about this app. It seemed an ideal fit. Since we are a high-end site, we had lots of more complex patterns as kC food; likewise, the kC capability could make our knitters' lives a lot easier. Patternfish's membership would be made aware of knitCompanion, if they weren't already; similarly, Sally's kC base could find out about Patternfish. Really a chocolate + peanut butter situation: inevitable and delicious. Bonus: her tech developer was actually in Canada (not Colorado), "in a place called Newmarket"-- which turns about to be only about 45 minutes by car from our tech person. Fate! Sally: "So, do we have a deal?" Julia: "I'll talk to the boss." (Beat.) "She says yes." We knew we had to check with our tech folk to see if it would work, so we did, and they made it happen. It did take many months, but we expected that. Yay, Phil and Jeff! At the end of our talk there was a moment I found immensely impressive and touching. "Come on, let's walk the show," I said. Sally shook her head. "I can't. I'm not a member yet." "Are you telling me that you flew all the way from Colorado to Long Beach and you can't even visit the show floor? Did you come all the way down here just to meet with me and not see the show?" 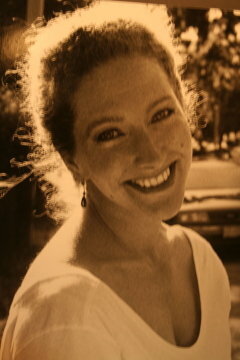 I remember looking at her-- in her determination, conviction, and intelligence, an entrepreneur incarnate. "Come on. Let's get you a Patternfish badge. You're an associate now. There's no way you can come all the way down here and not walk the floor. You can explain to people what the situation is." I got her one and off she went to do her entrepreneurial good. Just so you know, our financial arrangement is like this. When a pattern preformatted for kC is sold, the publisher/designer gets their usual commission on that sale; kC takes none of it. They make their money on the $4 kCDesign module that constitutes the preformatting for the app-- they get most of the $4 (we still pay the PayPal fees and so on). Very simple and win/win, we all think. 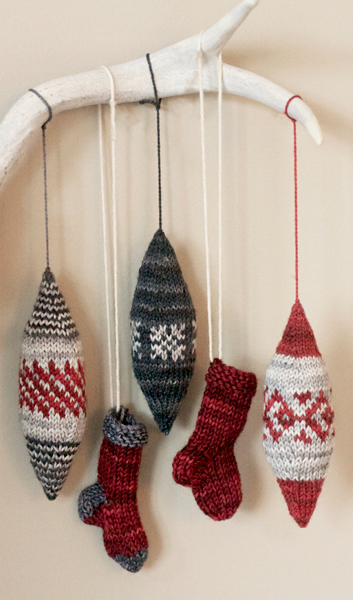 It’s fun to ask others to step in and choose patterns for this gift issue. I’m often surprised by the choices, and invariably learn something, about the person or the patterns. 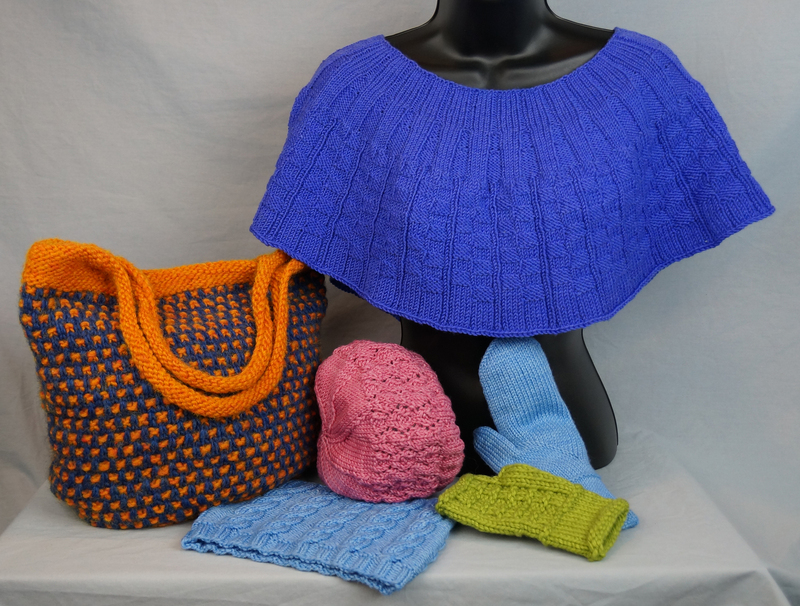 This gift season Dale Hendry, a seasoned knitter, and Sandra McCubbin, a brand new knitter, have generously offered their choices. Sandra is a young woman I’ve known since she was a baby; what a delight it was when she became interested in knitting. I asked her to select gifts she’d like to give and to receive. I have always wanted to knit a cute dress for my niece, Aurora, who will be turning two in November. I love that this dress can be worn in all seasons! I’d like to make this shawl for my friend, Sarah, who works in an office that is so cold, she spends most of her life wrapped in a blanket just to stay warm at work. There are so many beautiful shawls on Patternfish, including this one which suits my skill level. I’ve never knit socks before, but they’re on my list of items to knit next. It seems like this pattern is exactly what I need to learn how! I’d like to knit these as a stocking stuffer for my mom. I’d like this shawl for me. It’s inspired by a beautiful shawl pin I received as a Christmas present last year. Knit to the correct size, I think this pattern would make a beautiful wrap. I don’t yet have the skills to knit this funky pattern, but I love it! I love pairing colourful scarves with fall and winter jackets. I love a simple cardigan to pair with jeans and a t-shirt. I like that this pattern has ¾ sleeves because I always find myself stretching the cuffs of my sweaters and cardigans after pushing the sleeves away from my wrists while I’m working or cooking. The newest addition to the Patternfish team is pattern poster Dale Hendry, a knitter and crocheter from a family of “makers”: mother, grandmother, great grandmother. Dale’s knitting passion began at age 8 with knitting doll clothes (that’s starting with the hardest, I think), followed by sweaters for herself in public school. The passion has continued. For the littlest ones, Dale picks this sweet outfit of cardigan, hat, and blanket. The Dragon Hat is sized all the way to adults so matching daddy and baby gifts are possible. And to cuddle, the felted Polar Bear. Dale loves knitting socks and finds they are not only a welcome gift but a great place to stuff treats. What mitten choices - from the rocky east coast shore of Nova Scotia in stranded knitting, to perfectly fitting cabled mittens, to a folk art mitten bonanza plus hat. Dale’s hats, worn only when absolutely necessary, have to be knitted and warm. 1700 is not a typo. Need an Accessory from Cabin Fever has that many combinations of sizes, yarn weights and stitch patterns for hats, mittens, mittlets, infinity scarves, caplets and bags. Such fun to choose! There’s a version for iPads and other mobile devices, too. Sally Melville is one of the Editor’s favourite designers. Her first book, Styles, was the first knitting book I bought and I liked it not only for the patterns but also for how she encouraged knitters to develop their own creativity and look at knitting in new ways. It’s such a pleasure to introduce two Sally Melville designs, L’Enveloppe and Lace Meets Scarf, both available in kCDesign. Go to the pattern pages, read the descriptions, and you’ll get a good understanding of how Melville’s inventive mind works. She gives the knitter a garment that is not only beautiful, but intensely wearable. In September we welcomed 6 new publishers and designers to Patternfish. Bergros Kjartansdottir debuts at Patternfish with designs that evoke her Icelandic heritage, but are uniquely wearable designs for this century. Blaskel has a yoke that is recognizable as Icelandic, but was inspired by the blueshells (actually blue shells!) found on Iceland’s coast. Garter stitch hem and cuffs give the jacket weight and style. With Solrisa, it’s quite possible to imagine to the sunrise over an Icelandic village that inspired it, a comfortable sweater/tunic/ jacket with seed stitch hem and cuffs. Have you ever seen a pattern publishing name that is a promise as well as a brand? 10 Hours or Less makes that promise for both knit and crochet patterns. Not only are they quick to make (lots of them fewer than 10 hours), but most, like Sumptuous Scallops, offer instructions for making any size with any weight of yarn. You’ll notice, too, that the knit and crochet options are sometimes complimentary, like this cabled knit scarf and its crochet companion. Some designers become known early in their careers for a focus on particular yarn weight and stitch patterns, but Kelene Kinnersly is confident with both cardigans in worsted weight, like her Oceanna Cardigan, and her lace shawlette in DK yarn, Pashmina. All Kinnersly designs are characterized by attention to detail, like i-cord bind offs and beautifully shaped necklines. Lete’s Knits' Justyna Lorkowska excels with big knits, like The Big Cable, a dramatic coat or jacket, with just a few simple horseshoe cables running from hem to neckline. Garter stitch ensures warmth and easy knitting. The Fuego Hat, a one worsted skein pattern, features a cable pattern that is unusual from cast-on to pom pom and has twisted stitch ribs that hug the head. Tamara Ell’s designs in knit and crochet are dramatically different from one another. Ell’s Lace Infinity Cardigan’s impeccable instructions ensure complete understanding of her one piece, no-seaming process. The Drop Leaf Shawlette, a wonderful gift for a fun loving friend, is adaptable to just about whatever yarn you have on hand. Spinners in particular, take note. We don’t often knit cardigans as gifts, but Lithos, by Jennifer Dassau of The Knitting Vortex, has a feature that makes it possible to get one done by the holidays, bulky yarn. It’s a quick knit, but not without some intriguing construction, so the knitter will learn as well as produce. Dassau’s shawls, like Rondelay, are creatures of non-traditional shaping, shaping that wraps and drapes beautifully. Choose a variegated yarn for this one. Most of us have a friend whose elegance we admire. These slippers, ascots, and Katya Frankel’s beloved Ritzy could fill the gift need. I’ve made Natalie Servant’s Strand of Pearls and always feel special wearing it. Or if you are feeling ambitious, choose Jared Flood’s Girasole as a blanket or shawl. 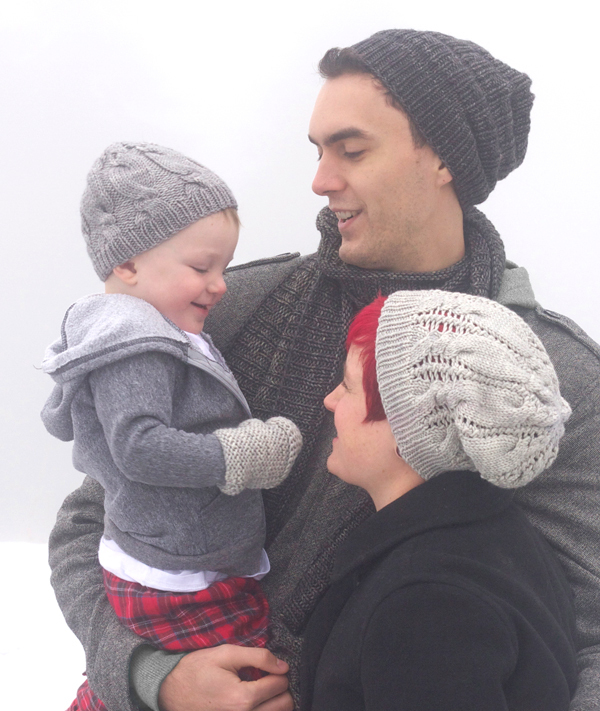 What is the Perfect Gift - Hats, Scarves, or Cowls? It’s a debate: are hats the perfect holiday gift, or are scarves? Or would you vote for cowls, the gift that didn’t really exist a decade ago? All three are warm and don’t require much in the way of specific sizing. Hats and cowls use less yarn and take less time than scarves. The only necessity for each is the ‘no itch’ factor. If you think hats are the best gift choice, here are some choices we like for everyone from newborns to grownups and everyone in between. Shawls become scarves when the the weather turns. These choices lean to the simple and several recommend using needles a size or two larger than the ball band recommendation for good drape. These cowl options are close-fitting or loopy, knit or crochet. They can be for men or women depending very much on the yarn you choose, and all are virtually guaranteed to be warm. If you are going to make mittens for a gift for anyone but children, they need to be very special, or they need to be especially warm. When the occasion calls for leather gloves, but you want warm hands, too, fingerless mittens provide welcome warmth. Just don’t knit them too tight and use soft, natural fibre yarn. Hand made socks are such a treat. Here are socks for the crocheter, for the knitter who prefers to knit flat, not circularly, and for the fan of variegated yarns. The nice thing about making gifts for dogs is they never say they don’t like it, or it’s the wrong colour, or it doesn’t fit. Include a favourite treat in the package and the joy will be guaranteed. There may be more people wearing these Knitted Mukluk Slippers from Knitting Pure and Simple than any other hand knitted slipper. It’s becoming a Patternfish tradition to include these extra warm slippers for kids and adults in our gift newsletter. For a fitted slipper, Kris Basta’s Options Slippers for men, women, and children are popular. The favourite crocheted slipper pattern is from Knot*Sew*Cute, their Cottage Slippers. Babies first holidays are very special for aunts, related or otherwise, grandmothers, and moms. Some of these selections are pure baby, while others are designed to fit all the way to age 7. Lucy Neatby’s Storm Mountain Hat may be knit for newborns to adults. If someone were to ask me what gift I wanted, I would say slippers. My feet are always cold and so are my ankles, so the slippers I want would cover more than my feet. Each of these patterns from the 2104 Gift Newsletter offer kCDesign formatting as an option.